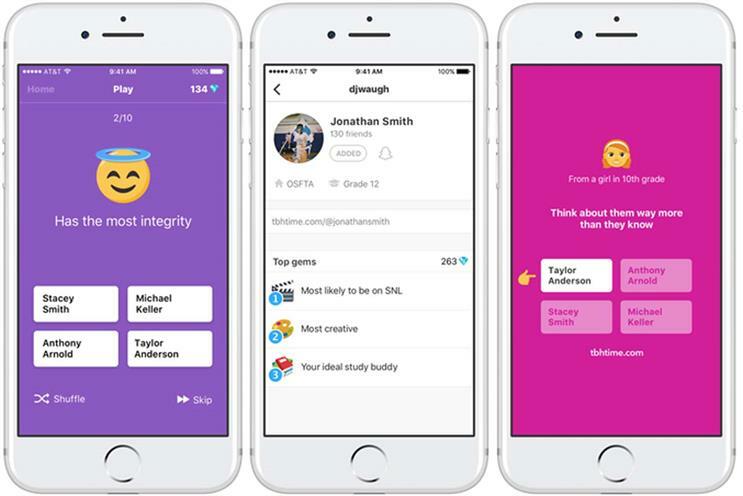 Facebook has bought social polling app tbh, which invites users to anonymously answer good-natured multiple choice questions about friends, and then sends the answers to the subjects in the form of compliments. The tech giant was likely to pay have paid less than $100m (£75.4m) for the business, TechCrunch reports – around 1% of the $19bn it forked out for WhatsApp in 2014. Tbh officially launched only in August, and has since racked up 5 million downloads, 2.5 million daily users, and more than a billion poll answers. It is at present only available in certain US states, and only on iOS. The deal was announced in a post by tbh’s founders. It read: "When we set out to build tbh, we wanted to create a community that made us feel happier and more confident about ourselves. We felt that people craved genuine and positive interactions in their online experiences. "While the last decade of the Internet has been focused on open communication, the next milestone will be around meeting people’s emotional needs. "It looks like this hunch might be true: over the last few weeks, over 5 million people have downloaded tbh and sent over a billion messages. More importantly, we've been inspired by the countless stories where tbh helped people recover from depression and form better relationships with friends. "Today we’re announcing that we’re joining Facebook to continue our mission."